Meredith mentioned on Friday that she was going to make Leah's 3-2-1 Beef. I don't know how I skimmed over this recipe and never made it. Especially since I love French Dip Subs and Pioneer Woman's Drip Beef sandwiches. When I reread the recipe this weekend while I was lying in bed, still not feeling so hot, I thought the recipe sounded awesome. Leah had me at cole slaw. It immediately made me think of the awesome sandwich I had in New Orleans. Plus the recipe was SO EASY. Unfortunately I seemed to be out of meat in my freezer so I had to drag myself to the store. I bought the bag of cole slaw where you just mix the dressing with all the cabbage. I may try my own version next time since it wasn't vinegary enough for me. I halved the recipe since I was making it for just me and John (plus it's really easy to do). I also bought a single beer of Young's Double Chocolate Stout. 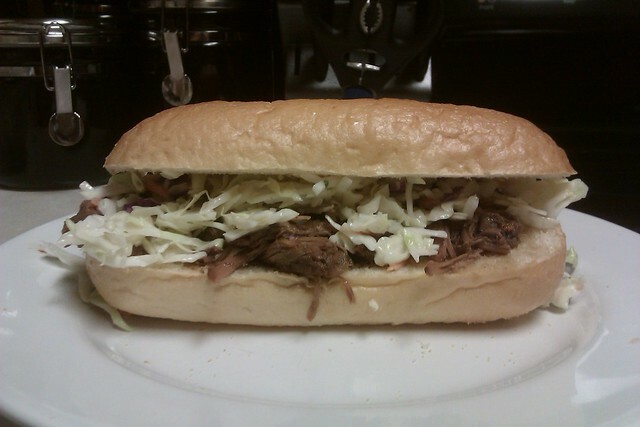 I toasted the roll and poured some of the juices on it before adding the beef and slaw. John added swiss cheese to one of the two he ate. They were THAT good. Seriously, it is an awesome recipe...we use Black Butte Porter, which is pretty much Justin's favorite beer, and I love the taste and tenderness that it gives the beer. I also really like to freeze some of the beef in the au jus, and use it for enchiladas/tacos/etc. This was truly the week for them, I made them too on Sunday? Saturday? I can't remember now! So glad you initially tried them Mer and I'm glad you went for them too Faith! Well, I guess I made 3-1-1-1 beef . . . 3lbs of roast, 1 package of beefy onion soup mix, 1 big T of garlic herb Mrs. Dash and 1 Shiner Bock. Willy and Jonah wanted to eat the aroma!